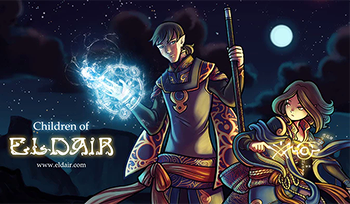 Children of Eldair is a webcomic by Jemma M. Young and Rachel A. Oaks. A sorcerer named Koe finds an unconscious girl named Embera and nurses her back to health. He then offers to help her find her friends, Indri and Iva. He takes her down to his gazing pond to read the stars there, and begins seeing the events as three young women from a place called America are ripped from their lives and brought to Eldair. Alternative Calendar: Eldair has 405 days in a year compared to Earth's 365. Koe also mentions being familiar with several forms of calendar, but not the one Embera mentions, since she's from Earth. Eldair's calendar is described in detail on this page . Astral Projection: How Koe manifests while observing the past. He can walk to different places and watch, but can't interact or communicate with anyone. Astrologer: Koe seems to be one, using his gazing pool to read the stars, which is how he is able to see Embera's past. Art Shift: Often used when someone is telling legends of Eldair. Inspired by Inuit art. Blonde, Brunette, Redhead: Indri, Embera and Iva, respectively. Burning with Anger: Kian after Hallren sends him on a patrol to find the shadow creature. Creation Myth: The comic begins with a telling of how the God and Goddess created Eldair and planted their children on it. Later another one is heard from the Elves perspective. Face Palm: Iva's reaction to Indri claiming to be afraid of snakes. Iva: Indiana Jones? Now? Really? Fangirl: Indri is a fan of Harrison Ford, and has a tendency to tell stories about her "Uncle Indy". Finger-Twitching Revival: The first sign of life Embera shows after Koe brings her to his home. How We Got Here: The story starts with Koe finding Embera injured and then using some kind of scrying to see where she came from and what happened. Jerkass: Hallren spends his time basically being unpleasant to everyone. Mathematician's Answer: An exchange seen here . Indri: I like a man who's good at what he does. Kian: Being a cad? Or using my muscles for dubious purposes? Mistaken for Gods: When the girls first arrive on Eldair, they are mistaken for angels by Princess Hamara's company due to emerging from some sacred pools and Hamara having dreams of their arrival. Mix-and-Match Critters: The elves' mounts are some kind of horse-deer-goat things. Our Demons Are Different: They appear to be of the Living Shadow / Eldritch Abomination variety, appearing as shapeless blobs of darkness. Later on, they are bestowed the name "Flesh Eaters" due to the nature of how they are created and maintain form. Specifically, a tiny demon will strike and fuse with the victims's heart, which after a short period of time, will cause dozens of demons to spawn and tear apart the unfortunate victim from the inside out. The newly spawned demons then each trap a portion of the victim's flesh in their blob like bodies to maintain form, before going off to find more victims to consume and propagate. The only known ways to destroy a Flesh Eater is to either use magic against them, or knock whatever flesh/body part they're holding out of their form. Really 700 Years Old: Koe explains that he's a sorcerer and has studied magic for centuries. Embera is the child, quiet and sensitive, a bit naive at times. Iva is the wife, dutiful, sensible, caring and responsible. Indri is the seductress, and she practices being one virtually every time she and Kian are together. Shout-Out: Side characters in "The Razing" are named after characters in Attack on Titan. It doesn't end well for them. Trapped in Another World: The girls are snatched away from Earth and deposited on Eldair. Troubled Fetal Position: Embera hides under a bed when she curls up into one. Walk on Water: Koe seems to do this when bringing Embera to his gazing pool. Word of God: Jemma and Rachel often have comments below the pages. You Can See Me? : While watching the ceremony granting the girls the Goddess' blessing, Koe is surprised when the Goddess turns to him and offers him her blessing as well.